DOT’s plans to improve pedestrian safety along the length of the Bronx’s Macombs Road [PDF] received a unanimous vote of support from Bronx Community Board 4 last night, according to District Manager José Rodriguez. The plan puts Macombs on a road diet and reconfigures dangerous diagonal intersections that lead to drivers taking fast turns across the crosswalk. Currently, Macombs is a wide road with low traffic volumes, a recipe for high speeds. To make matters worse, the curvy road is characterized by irregular intersections that allow turning drivers to remain at high speeds; at some, the gentle angle makes turns more like full-speed forks in the road. As a result, 102 people were injured in traffic crashes along Macombs’ roughly ten blocks between 2005 and 2009: 69 motor vehicle occupants, 26 pedestrians, and 7 cyclists. One person was killed in 2008 at the intersection of Macombs and Goble Place. DOT’s proposal would remove one lane of traffic from Macombs in each direction. That extra space would go toward a new median (sometimes a physical island, sometimes painted stripes), as well as wider parking lanes. At certain intersections, DOT will add additional features. At Cromwell Avenue, for example, DOT will install a new pedestrian triangle to slow turning cars and shorten crossing distances. A neckdown will also force drivers traveling southbound on Macombs to actually make a turn onto Cromwell, rather than simply heading straight onto it at speed as Macombs turns left. A new triangle will also be added at Featherbed Lane, where drivers have a similarly free right turn. Just wait until they finish the project and people come out of the woodwork saying to the media that Bloomberg/ JSK didn’t personally ask them permission to do this. Then even after new data shows safety improvements a group of wealthy motorheads will sue because it feels less safe for them to double-park their car! I’m not sure, the demographics are pretty different between BX CB4 and BK CB6. This looks to be a great project for the West Bronx. This takes a standard road diet and adds some very effective pedestrian improvements. Too many intersections in the city allow for very fast turns across crosswalks. This design slows down turns, making it much safer to walk. Thanks for reporting this, as it could easily have slipped through the cracks. Also, this doesn’t seem like it will not prevent any millionaires with fancy lawyer friends from double parking in front of their penthouses. I’d love to see something done about he 30 degree right hand turns that fork off of Ocean Parkway through the bike path. Most drivers think the limit on Ocean parkway is 45, not 3. I would love to see more of these kinds of road rehabilitation projects here in other parts of the Bronx… keep it up, DOT. Broadway north of 242nd St is another road that is too wide for its own good and thus makes for hazardous pedestrian crossings and 50mph vehicle speeds. A woman was killed crossing the street to get to Van Cortlandt Park last year, just north of the 1 train terminus. I assume this road diet is a project that Bronx CB4 had requested? Excellent. Please do more of these! We love you in the Bronx, DOT! I am happy for this street improvement, but I wish it had gone further. I wish that 10′ wide median could be a two-way bike lane with buffers and bollards (sort of similar to Allen Street), but it seems that the median will have to also serve as a turning bay at certain intersections. It seems this road would have had room to include bicycle infrastructure in other places if not as the median: the two travel lanes are 11′ wide when they could be only 10′ wide; the parking lanes are 13′ wide when they could each be 11′. 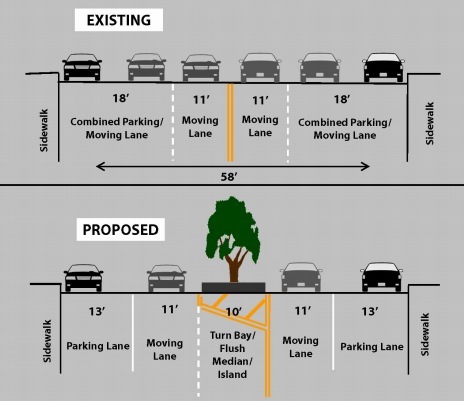 This means that even with the 10′ median, with narrower travel and parking lanes, there would have been 6′ extra of road space to use towards bicycle infrastructure. 13′ parking lanes are essentially unmarked (and unenforced) bike lanes. Parked cars are about 7′ wide, so this leaves about 6′ for bike traffic. A 13′ parking lane is 90% as good as an unbuffered, unprotected bike lane. It IS an unbuffered, unprotected bike lane, just minus the paint. Wouldn’t it be better to narrow the median and build real bike lanes, instead of hoping cars accept the 6′ gap as ersatz bicycle space instead of weaving in and out of the parking lane? Sure. But they’ll weave in and out of a bike land to get to and from parking anyway. Its like the bedford avenue lane that was removed. They got rid of the bike symbol, yes. But basically it is still a bike lane. Perhaps this design is taking cyclists into account while trying to avoid controversy? These days, I’m for better crossings for pedestrians, slowing traffic and repainting the lanes we already have that are really neglected. Franklin and Bedford aves. in Bed Stuy come to mind. Cyclists are left out of the design in order to accommodate double-parking. I’m not being tongue-in-cheek here or anything. Just think about the dimensions. Alon: From an engineering perspective, yes. From a political perspective, bike lanes are the third rail of street safety right now, and if DOT presented the identical project but with bike markings, everyone would scream and holler about how the bike radicals were taking over the government, won’t somebody please think of the pedestrians, blah blah blah. But the exact same project without the bike markings gets a unanimous vote in favor. Savvy politics by DOT, especially if they come in in a few years and point out that by painting one extra line, they can provide bike lanes at no cost to any other street user. Will they do that? I have no idea. You are all correct that there is certainly enough space for high quality bike lanes (cycle track on both sides), but I think this is not the place for them at present, since cycling hasn’t really caught on in the Bronx. The project would add controversy to an uncontroversial ped project, putting those improvements in jeopardy. As designed, it creates a much better biking environment, through the addition of de facto bike lanes. I’d focus the controversial bike infrastructure on areas with lots of latent demand and then expand from there. Measuring latent demand is tough, but you can get an idea from the CBs that are pushing for bike improvements. To clarify, what I’m proposing as a future alternative is not just bike lane markings, but also a narrower median with real, i.e. protected, bike lanes. The implicit question is whether Macombs is important enough to warrant buffered lanes, or whether they should go on a nearby road instead, such as Jerome or University. The entire length of this street is parallel to two existing bike lanes, one about 5 blocks to the west and the other about 5 blocks to the east. This street’s importance to the bike network cannot be understated. 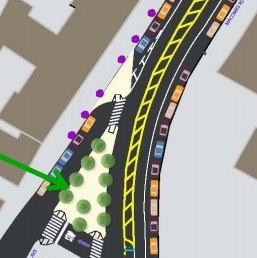 I’m not saying this couldn’t be done – but a smaller median would mean eliminating the left turn bay. 2) More importantly (and the reason the bike lane is where it is already), Macombs Road is taken up in its entirety by an enormous hill. I’m talking about a mountain of the type you’d find in San Francisco. The high end is the north end. I rode up Macombs Road once, and it was pure hell. I’d be very reluctant to do so again, even with a bike lane. The Grant/University lane is also hilly, but much easier. @Mike, SoBronx Resident: thanks for the explanations.